A classical Italian dish with ricotta, Napoli tomato sauce and chicken mince is also great for the budget. Melt butter in a large frying pan, add leek and cook for 5 minutes or until softened. Add peas, cook for another 2-3 minutes then remove from heat and set aside. Heat oil and onion in the frying pan and cook until softened, then add chicken mince, stirring to break up the mince. Add KNORR Professional Garlic Puree and cook for another minute. Pour in wine and allow to reduce by half. Spoon a rough cup measure of chicken tomato mixture into base of a half gastronome tray. Top with a third of lasagne sheets. Continue with half the remaining chicken tomato mixture, then spoon over half the sauteed leek and peas, half the spinach leaves and half the ricotta. Continue layering with rest of the lasagne sheets, chicken tomato mixture, leek, peas and spinach. Finish with lasagne sheets, ricotta and top with tasty cheese. Bake for 40 minutes at 170 degree Celsius or until golden. 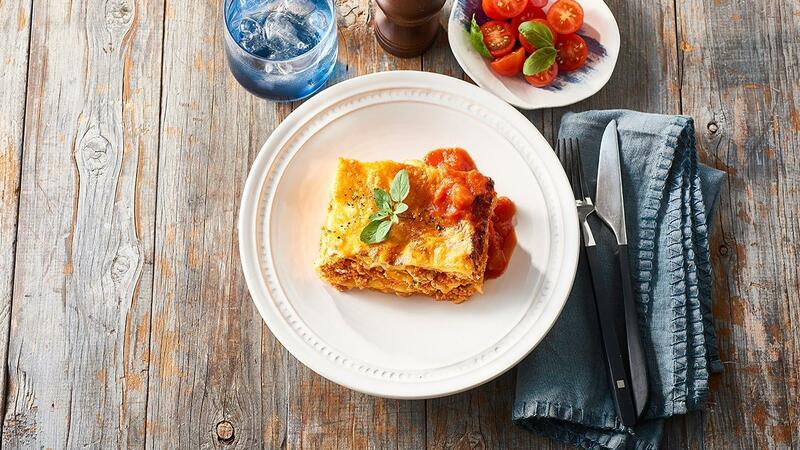 Serve lasagne garnished with oregano leaves. A great way to get extra nutrition by bulking out layers with baby spinach.